آرشید, احسان, خورشیدوند, احمدرضا. (1396). تحلیل ارتعاشات خمشی ورق های دایروی متخلخل اشباع شده با استفاده از روش مربعات دیفرانسیلی. نشریه پژوهشی مهندسی مکانیک ایران, 19(1), 78-100. احسان آرشید; احمدرضا خورشیدوند. "تحلیل ارتعاشات خمشی ورق های دایروی متخلخل اشباع شده با استفاده از روش مربعات دیفرانسیلی". نشریه پژوهشی مهندسی مکانیک ایران, 19, 1, 1396, 78-100. آرشید, احسان, خورشیدوند, احمدرضا. (1396). 'تحلیل ارتعاشات خمشی ورق های دایروی متخلخل اشباع شده با استفاده از روش مربعات دیفرانسیلی', نشریه پژوهشی مهندسی مکانیک ایران, 19(1), pp. 78-100. آرشید, احسان, خورشیدوند, احمدرضا. تحلیل ارتعاشات خمشی ورق های دایروی متخلخل اشباع شده با استفاده از روش مربعات دیفرانسیلی. نشریه پژوهشی مهندسی مکانیک ایران, 1396; 19(1): 78-100. پژوهش حاضر به تحلیل ارتعاشات ورقهای دایروی ساخته شده از مواد متخلخل میپردازد. ورق نسبتا نازک و خصوصیات مواد متخلخل به صورت توابعی که ارائه شده اند در راستای ضخامت ورق متغیر است. معادلات حاکم و شرایط مرزی بر اساس تئوری کلاسیک و با استفاده از اصل همیلتون حاصل میشوند. به کمک روش مربعات دیفرانسیلی، فرکانسهای طبیعی محاسبه میشوند. با افزایش تخلخل، فرکانس در توزیع غیرخطی متقارن تخلخل افزایش و در توزیع یکنواخت ثابت میماند و در هر دو توزیع، با افزایش فشردگی حفرات، فرکانس افزایش می یابد. نتایج در حالت ساده تر با پژوهشهای پیشین صحه گذاری شده اند. Detournay, E., and Cheng, A. H. D., “Fundamentals of Poroelasticity”, Pergamon Press, New York, (1993). Abrate, S., “Free Vibration, Buckling and Static Deflections of Functionally Graded Plates”, Composites Science and Technology, Vol. 66, No. 14, pp. 2383-2394, (2006). Reddy, J. N., and Khdeir, A. A., “Buckling and Vibration of a Laminated Composite Plate using Various Plate Theories”, AIAA Journal, Vol. 27, No. 12, pp. 1808-1817, (1989). Decha-Umphai, K., and Mei, C., “Finite Element Method for Nonlinear Forced Vibrations of Circular Plates”, International Journal for Numerical Methods in Engineering, Vol. 23, No. 9, pp. 1715-1726, (1986). Wang, Y., Xu, R., and Ding, H., “Free Axisymmetric Vibration of FGM Circular Plates”, Applied Mathematics and Mechanics, Vol. 30, No. 9, pp. 1077-1082, (2009). Najafizadeh, M. M., and Heydari, H. R., “An Exact Solution for Buckling of Functionally Graded Circular Plates Based on Higher Order Shear Deformation Plate Theory under Uniform Radial Compression”, International Journal of Mechanical Sciences, Vol. 50, No. 3, pp. 603-612, (2008). Wu, T. Y., Wang, Y. Y., and Liu, G. R., “Free Vibration Analysis of Circular Plates using Generalized Differential Quadrature Rule”, Computer Methods in Applied Mechanics and Engineering, Vol. 191, No. 46, pp. 5365–5380, (2002). Brayan, G. H., “On the Stability of a Plane Plate under Thrust in its Own Plane with Application to the Buckling of the Side of a Ship”, Proceeding of the London Mathematical Society, Vol. 1, No. 1, pp. 54-67, (1890). Reismann, H., “Bending and Buckling of an Elastically Restrained Circular Plate”, Transactions of ASME Journal of Applied Mechanics, Vol. 19, No. 2, pp. 167–172, (1952). Amon, R., and Widera, O. E., “Stability of Edge-reinforced Circular Plate”, ASCE Journal of the Engineering Mechanics Division, Vol. 97, No. 5, pp. 1597–1601, (1971). Yamaki, N., “Buckling of a Thin Annular Plate under Uniform Compression”, Transactions of ASME Journal of Applied Mechanics, Vol. 25, No. 3, pp. 267–273, (1958). Klosner, J. M., and Forry, M. J., “Buckling of Simply Supported Plates under Arbitrary Symmetrical Temperature Distributions”, Journal of the Aerospace Sciences, Vol. 25, No. 9, pp. 181–184, (1958). Reddy, J. N., “Mechanics of Laminated Composite Plates and Shells: Theory and Analysis”, CRC Press, New York, (2004). Brush, D. O., and Almorth, B. O., “Buckling of Bars, Plates and Shells”, McGraw-Hill, New York, (1975). Najafizadeh, M. M., and Eslami, M. R., “Buckling Analysis of Circular Plates of Functionally Graded Materials under Uniform Radial Compression”, International Journal of Mechanical Sciences, Vol. 44, No. 12, pp. 2479-2493, (2002). 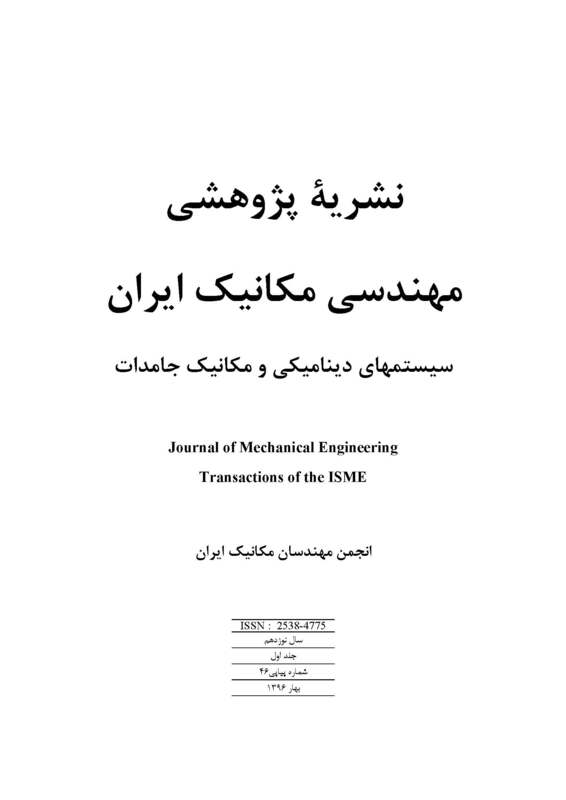 Jabbari, M., Mojahedin, A., Khorshidvand, A. R., and Eslami, M. R., “Buckling Analysis of a Functionally Graded Thin Circular Plate Made of Saturated Porous Materials”, Journal of Engineering Mechanics, Vol. 140, No. 2, pp. 287–295, (2013). Magnucka-Blandzi, E., “Axi-symmetrical Deflection and Buckling of Circular Porous-Cellular Plate”, Thin-Walled Structures, Vol. 46, No. 3, pp. 333–337, (2008). Khorshidvand, A. R., Farzaneh Joubaneh, E., Jabbari, M., and Eslami, M. R., “Buckling Analysis of a Porous Circular Plate with Piezoelectric Sensor-actuator Layers under Uniform Radial Compression”, Acta Mechanica, Vol. 225, No. 1, pp. 179-193, (2014). Liew, K. M., Han, J. B., Xiao, Z. M., and Du, H., “Differential Quadrature Method for Mindlin Plates on Winkler Foundations”, International Journal of Mechanical Sciences, Vol. 38, No. 4, pp. 405-421, (1996). Zong, Z., and Zhang, Y. Y., “Advanced Differential Quadrature Methods”, Chapman and Hall/CRC, New York, (2009). Theodorakopoulos, D. D., and Beskos, D. E., “Flexural Vibrations of Poroelastic Plates”, Acta Mechanica, Vol. 103, No. 4, pp. 191-203, (1994). Leissa, A. W., “Vibration of Plates”, NASA SP, Washington, (1969). Chen, D., Yang, J., and Kitipornchai, S., “Free and Forced Vibrations of Shear Deformable Functionally Graded Porous Beams”, International Journal of Mechanical Sciences, Vol. 108- 109, pp. 14-22, (2016).